Click on ORION: Personalized Practice from the Resource Ribbon. Once on the ORION Dashboard, find the chapter you wish to start and click Begin. Select your Confidence Level and click Continue. This will start the Diagnostic questions to assess your current knowledge level. For each of your chapter ORION activities you will need to answer a minimum of 30 questions in order to receive a grade on the assignment. As part of your 30 questions there will be a diagnostic portion. The number of diagnostic questions will depend on the objectives of the chapter. For example, Chapter 1 would have 16 and Chapter 4 would have 26. After you have completed the diagnostic questions you will get a pop-up window shown below. In that window you will see an Information box. 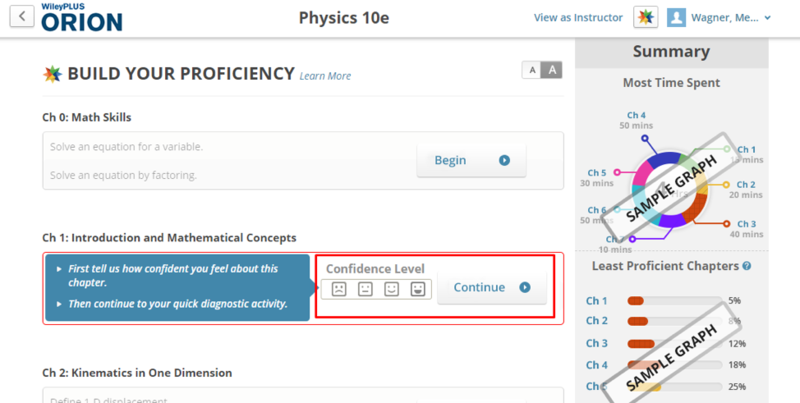 This box will let you know your current Proficiency score from the Diagnostic and provides the next steps to complete the assignment, which is to: Go to Dashboard. 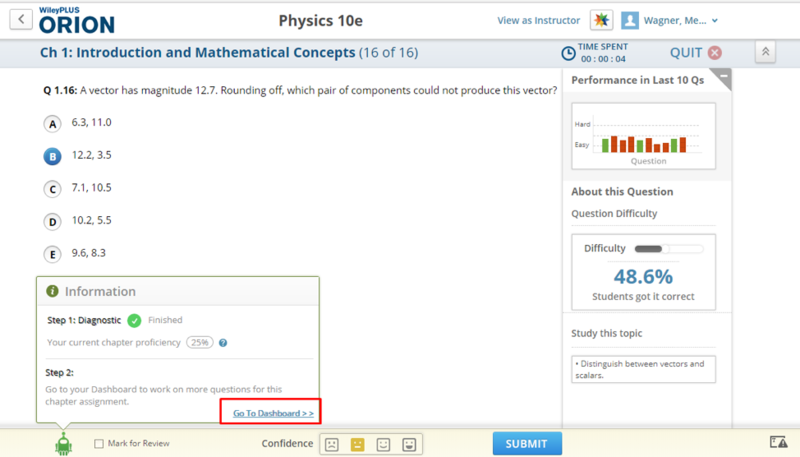 After clicking on Go To Dashboard, you can return to that chapter and click on Practice. You can then continuing practicing questions until you hit the minimum number of questions required to receive a grade by the due date stated in your Course Schedule. (In this example above, 16 Diagnostic Questions were completed, therefore, 14 more have to be completed to reach the minimum of 30 questions to receive credit for the assignment.) Once 30 are complete you can click Quit to stop working in ORION. The last step to ensure grades are sent over properly to the WileyPLUS Gradebook is to click the back arrow to WileyPLUS. MOST IMPORTANTLY: YOU NEED TO COMPLETE AT LEAST 30 QUESTIONS IN ORDER TO RECEIVE A GRADE ON THE ACTIVITY. When you have completed all questions in the Diagnostic, you will have a pop-up box appear. This will give your current Proficiency. Click Go to Dashboard to continue practicing. Click on Practice next to the same chapter to continuing practicing questions and improving your proficiency. 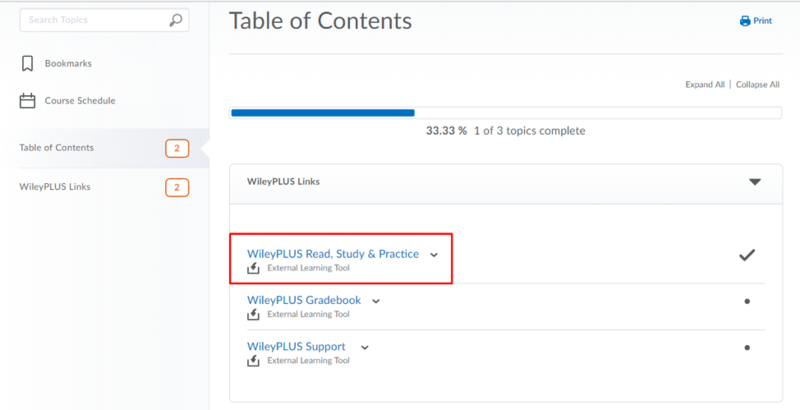 After you have completed the minimum number of questions for your assignment, be sure to click the arrow back to WileyPLUS. This will ensure that your ORION score is synced correctly with the WileyPLUS Gradebook. You can continue to return to ORION up until the due date to improve your proficiency and gradebook score, so long as you continue to hit the arrow back to WileyPLUS. Any practice questions completed after the due date will improve your Proficiency score but will no longer affect your gradebook score. 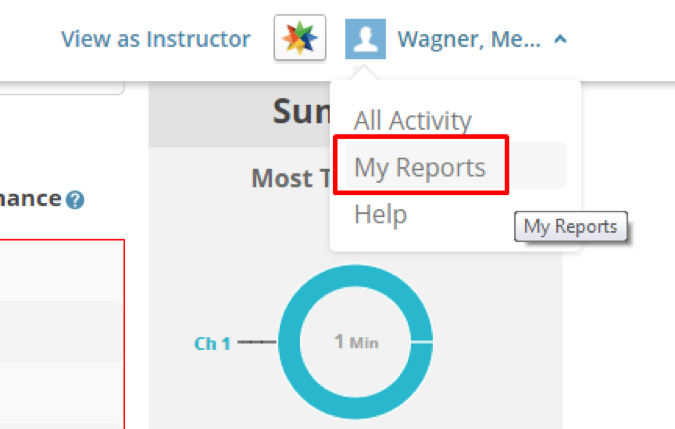 You can always hit the arrow next to your name and click My Reports to review your work in ORION. 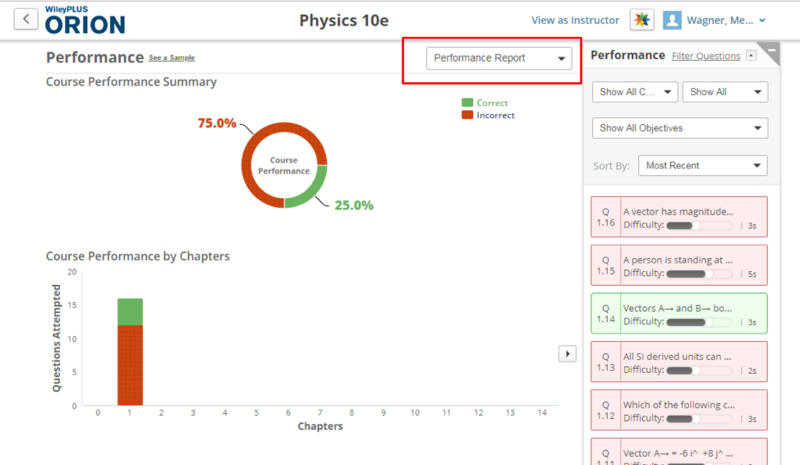 The Performance Report allows you to review your chapter proficiency and which questions you got correct and incorrect. Regarding the time you’ll be spending on each assignment: it really depends on the student. One student could just spend 30 minutes and answer all of the questions, others will take longer. It is the student, who will determine their final score on each activity. And remember, you can keep working on the activity up until the due date stated in your course Schedule. The “proficiency score” is made up of: the overall difficulty of the problems the student completed, the difficulty of the learning objective, how much time they may have spent on the question, among a variety of other factors. It is a holistic view of their overall working knowledge of the different learning objectives. The number of questions a student completes is somewhat related to their proficiency score, as we have found that the more questions a student completes, the greater chance their Proficiency score can increase. However, it really depends on the student. Some students can receive a 65% proficiency after 30 questions, while it may take others 50 questions to achieve this. A student’s score in the WileyPLUS Gradebook is based on two items: meeting the minimum number of questions required and their proficiency score. For example, if a student scored an 89% proficiency score in ORION but only answered 29 questions, they would receive a 0 in the WileyPLUS Gradebook. On the flip side, if a student scored a 15% proficiency score but answered all 30 questions, they would have a score in the WileyPLUS Gradebook (albeit a low one). On the next screen, you will see the list of questions in the right navigation area. Move your cursor over the right portion of the question list and access the slide-bar to view all questions. Red = Wrong answers, and Green = Correct answers. Click on each question to reveal the correct answer and your wrong answer. Posted by: Melody Fan - Thu, Jan 17, 2019 at 2:47 PM. This article has been viewed 297 times.